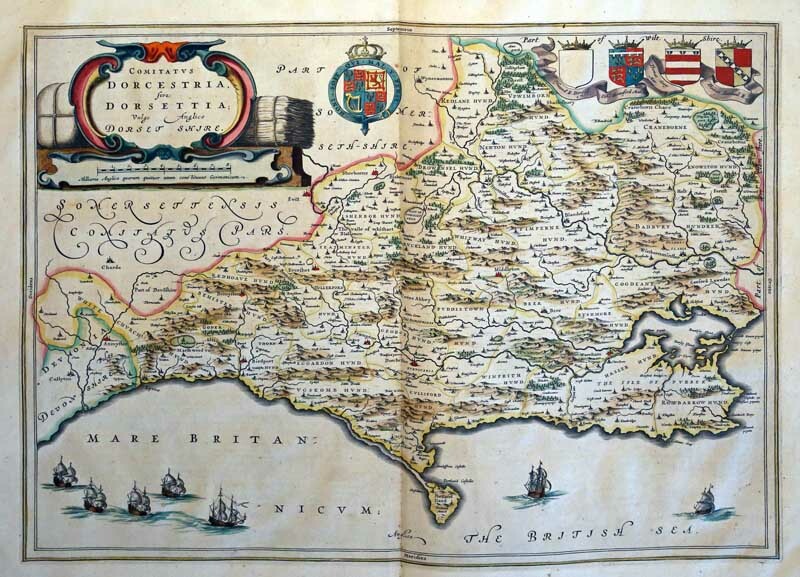 In I645 Joan Blaeu published a county atlas of England and Wales. It was part of his Atlas Novus and was based mainly on the researches of Saxton and Speed. In this work, Blaeu set standards of style and calligraphy that have never since been surpassed. Ornamental cartouches surrounded the names of the counties, superbly presented armorials lined the insides of the borders and in many cases the maps in the atlases were hand-coloured before they were issued, sometimes highlighted in gold. The map illustrated, measures 50 x 38 cms (20 x 15 ins) has a brightly coloured red and gold cartouche ﬂanked by bales of wool and hemp. These represent the two main cash crops of the county at that time, sheep on the downlands for wool and hemp for the manufacture of ropes and netting. The four coats of arms in the top right corner are the same as those on John Speed’s 1610 map; in the central is the royal coat of arms of the United Kingdom. A fine selection of galleons sail the English Channel (here called The British Sea).